U.P. Health System-Portage hospital photo Dr. Theresa Holladay will continue to provide gynecological services in the UP Health Systems -- Portage, but has moved to a new office in Internal Medicine, which gives her greater access to other specialists. Dr. Theresa Holladay is a gynecologist for UP Health System – Portage with a new office in Internal Medicine. Her specialization in gynecology, as well as her position within the internal medicine suite, allows her the ability to give specialized attention to the residence of the Copper Country. “[Internal Medicine] is a cool place. It offers a lot of different services for ages 18 and up,” said Dr. Holladay. These services are made possible by close collaboration between specialists that have offices in the suite, including rheumatology, hematology, oncology, cardiology, nephrology, dermatology and other specialists visiting Hancock. These specialists can then share records and advise one another to ensure that each patient gets quality, intensive, and holistic care. A difficult case in the early ’90s changed everything. Dr. Holladay completed the residency and became a certified OBGYN in 1998. 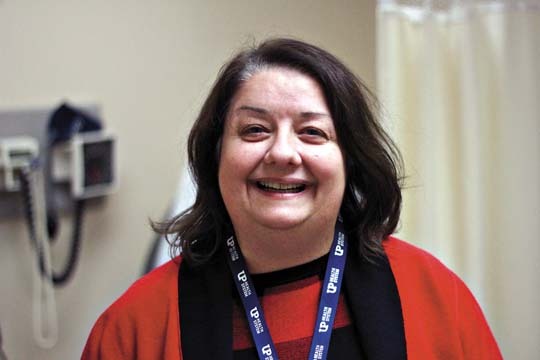 Dr. Holladay has been working in women’s health ever since, but her new position at UPHS-Portage allows her to spend more time with patients. The list of services that Dr. Holladay provides is long and includes routine gynecologic visits, menstrual management, pelvic floor problems, contraception, and fertility services, as well as screenings for cancer and various hormonal therapies. While the services can be drastically different from one another, they are all based in wellness. “Everyone worries about breast cancer but only 12 percent of women will develop breast cancer. However, 50 percent of women are affected by heart disease,” said Dr. Holladay. Fortunately, while problems with it can manifest in many different ways, wellness starts from common places. Dr. Holladay’s specific medical background places her in a great position to address those areas. Dr. Holladay may have a new office, but she is still very accessible to old and new patients. “Women’s health is direct access. Any woman can ask for access to an OBGYN as well as a primary care provider,” said Dr. Holladay. Internal Medicine is Suite 4 at UPHS-Portage’s main campus on Campus Drive in Hancock. It can be found by entering through the rehab entrance and turning left or by entering through the emergency entrance and turning right. You can also reach Internal Medicine by calling 483-1730. You can also find Dr. Holladay on social media.